Martin Logan brings ElectroMotion ESL speakers to the UK | What Hi-Fi? Martin Logan electrostatic speakers may not be to everyone's taste, but they certainly look distinctive. And while they could never be described as cheap, the latest incarnation is at least more affordable than its forebears. 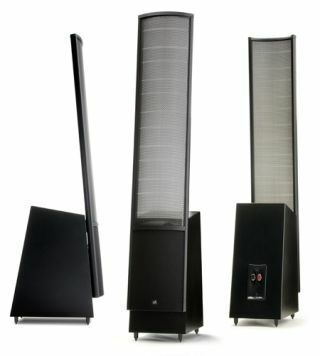 The ElectroMotion ESL (EM-ESL) is described as "the world's most affordable high performance hybrid electrostatic loudspeaker", costing £2499 a pair in satin black, or £2900 for the gloss black version. Designed to be equally adept with stereo music as multichannel film soundtracks, the EM-ESL features a 34in tall XStat electrostatic transducer combined with an 8in woofer. There's also a matching centre and surround speakers, featuring a new, larger Folded Motion XT tweeter, to make up a full 5.1 package. The Martin Logan EM-ESL is available in the UK this month from distributor Absolute Sounds.